This villa, facing the sea, is located in a quiet and residential area. The price includes all charges included (water, electricity, linen and bed, WIFI). End-of-stay cleaning is also included. Outside: fenced garden of 1000 m2 that can accommodate 2-3 cars. Electric gate with code or remote control. Garden Lounge. This comfortable residence, tastefully decorated offers all modern comforts. Wifi in all rooms. Ground floor: recent and convivial kitchen opened on a first space living room-TV. A large reception room with a second living room full sea view, a dining area, a piano. A room (bed 160x200) with dressing, a bathroom with shower and separate toilet. Upstairs, 4 bedrooms with wooden floors: 2 with double beds (140x190), 1 with 2 beds (80x190) convertible into one double bed (160x190), 1 with bed 90x190, bathroom with bath, separate toilet, storage. An office / reading room with magnificent sea view. Baby equipment (cot, bath, changing mat, high chair). A large shelf with books (English and French) for children and adults and CD / DVD. Basement, fully tiled: laundry area (washing machine, dryer, sink), sport (electric treadmill, elliptical trainer, yoga mats), 3 bikes (1 MTB Man 2 Dutch woman bikes), 1 WC . electrical panel and balloon of hot water. appliances: dishwasher, freezer, refrigerator, oven, microwave, induction hob, extractor hood, washing machine, dryer. small appliances: coffee maker, kettle, toaster, blender, raclette, griddle, hair dryer, iron. Tonic and invigorating environment, whether you are walking, golf, sailing, surfing, tours, restaurants, relaxing ... nothing is sure to stay. Saint-Lunaire Area (Saint-Malo, Dinard, Dinan, Mont-Saint-Michel, Jersey, etc) offer a wide variety of landscapes and activities for all ages. You will not get tired! The house suited us as a family of three generations perfectly. It was very clean, comfortable and well equipped. Catherine, the housekeeper, was very welcoming and accommodating. The only problem was with the electricity, which was underpowered for the cold weather at the start of the holiday and kept cutting out. However, we soon learnt how to manage the system. The position of the house by the beach suited the children wonderfully. St Lunaire had all the facilities we needed within easy reach. We cycled everywhere, only using the car once. So happy to know that you enjoyed your stay in villa Maelan and St Lunaire. It is indeed a beautiful place to enjoy a great family holiday. Children, parents and grand-parents having a great time together is, for us , the best reward ever. So sorry about the problem with the electricity at the beginning of your stay. It has now been solved by the French electricity Board. Beautiful home well decorated in a very nice area. Very pleasant surroundings. One suggestion to the benefit of the owner is to replace the mattress in the master bedroom. Otherwise all was very pleasant. We are happy to know you enjoyed your stay in our place. And so sorry the mattress was not to your liking (when someone else found it great a few months before; May 2017, Marie-Christine wrote 'literie top'). I guess this is primarily a matter of taste. It will be a pleasure to welcome you again in our beautiful part of Brittany. We loved the house and the location. Really enjoyed our stay in Saint Lunaire. It was a real pleasure to host Susan and her lovely family. Looking forward to seeing you again in St Lunaire in summer 2018 as already planned. Uns ist dieser herrliche Küsteabschnitt und die bretonische Küche seit vielen Jahren ans Herz gewachsen. Da wir diesmal mit Freunden eine Woche in St. Lunaire verbringen wollten, hatte wir nach einer größeren Unterkunft am Longchamp gesucht. Gefunden haben wir dieses wunderschöne Haus, mit einer tollen Einrichtung und super Ausstattung. Uns hat es an nichts gefehlt. Vielen Dank! Wir kommen gerne wieder - a bientôt! Auch beim zweiten Mal hat uns der Aufenthalt in St. Lunaire begeistert. Das Haus ist zu unserem bretonischen Zuhause geworden. Drei Generationen haben sich hier erneut außerordentlich wohl gefühlt. Man kann sich kaum ein besserers Domizil vorstellen. Details zu den Vorzügen des Hauses sowie des Standortes sind in unserer Bewertung von 2016 zu finden. Ein Sommer am Plage de Longchamp ist jedes mal ein Traum. We have been very happy to host you and your family for the second time. 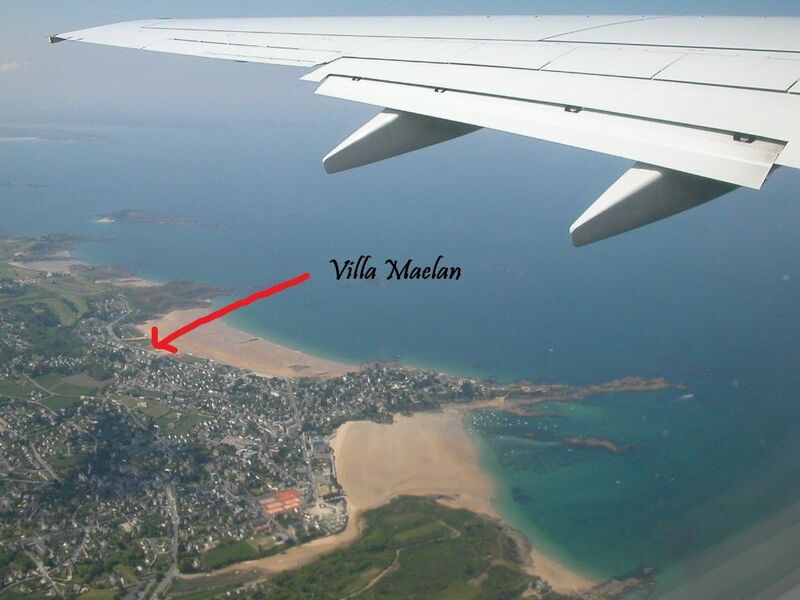 We feel truly touched by your love of villa Maelan, St Lunaire and this amazing part of Brittany. It is indeed such a nice place to spend the summer. It will be a great pleasure to welcome you again whenever you feel like it. Numerous restaurants in the area. Many cultural activities (cinemas, museums, aquarium ...) and sports (tennis, golf, water sports ...). les tarifs affichés s'entendent tout compris (eau, électricité, draps, serviettes, torchons, ménage en fin de séjour). Pour demande particulière, merci de contacter directement les propriétaires.